We’d only ever been in the grounds of Linlithgow Palace before. That was during the Pedal for Scotland, on that most welcome second last food and water break before you make your way through the Edinburgh suburbs to the finish line. (Fellow Pedallers will know what I’m talking about.) So we’d seen how stunning the Palace looks from the outside, but we’d always wanted to go in for a look around. 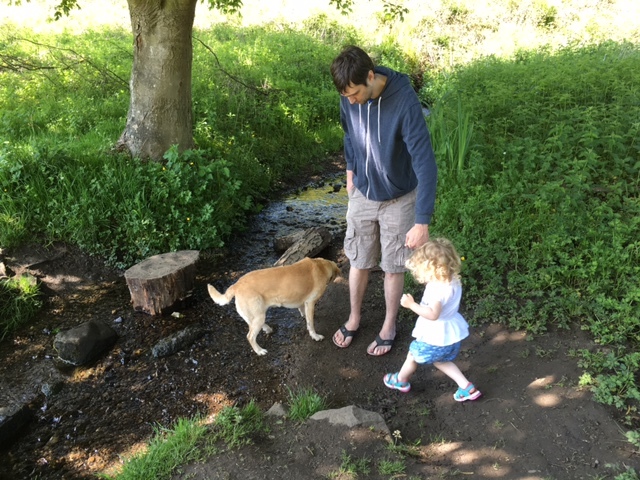 We finally managed along during the summer, on one of the warm sunny days, and we took the dog and a picnic along with us. 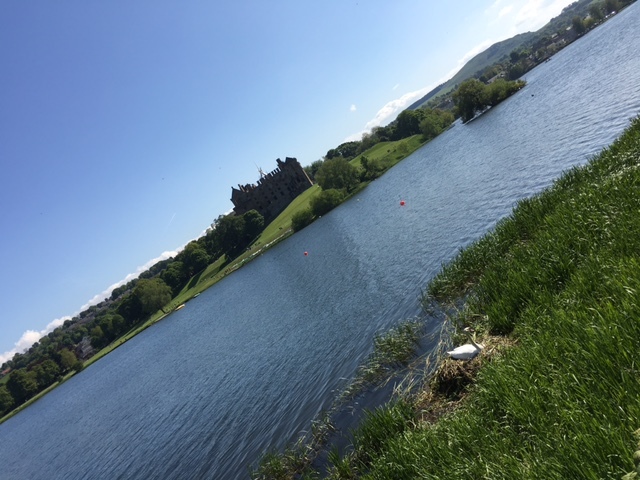 We spent a good while on the big grassy lawn between the palace and Linlithgow Loch, having our picnic and playing football with the little lady and the pup. There is a wee wooden playpark just along the path a little, with a few swings, a slide etc. Nothing fancy, but still fun. The walk round the loch was easy enough with the pram, though there are tree roots and the path is a little bit uneven in places. Linlithgow Palace is quite spectacular. 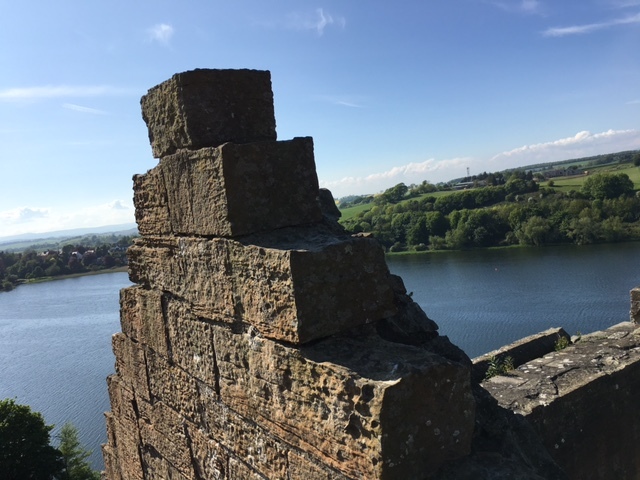 It is one of the biggest castles we’ve visited with the little lady and there are some really high parts to it where you can get amazing views across the loch if the weather is right. There is a lot to explore in here; spiral staircases, big halls, smaller rooms and an awful lot of fireplaces to hide in. There are lots of plaques around the palace telling the history and architecture of the place. 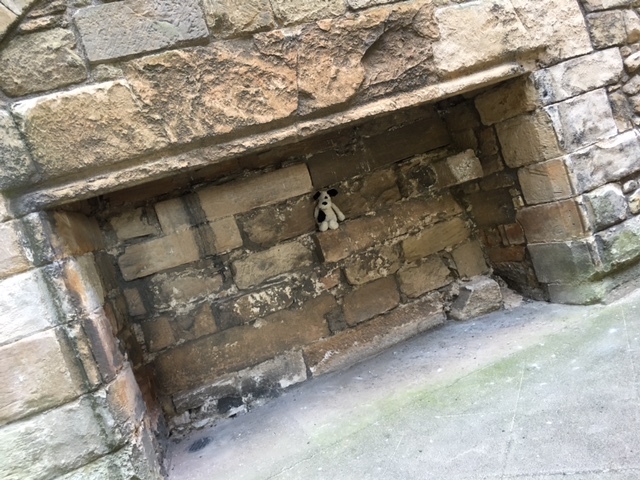 It was the birth place of Mary Queen of Scots plus a few other Scottish Monarchs, so it has a pretty interesting history. Visiting with a 3 year old who was continuously trying to hide from us, it wasn’t possible to read about the history properly, but we got the gist of how important it was! 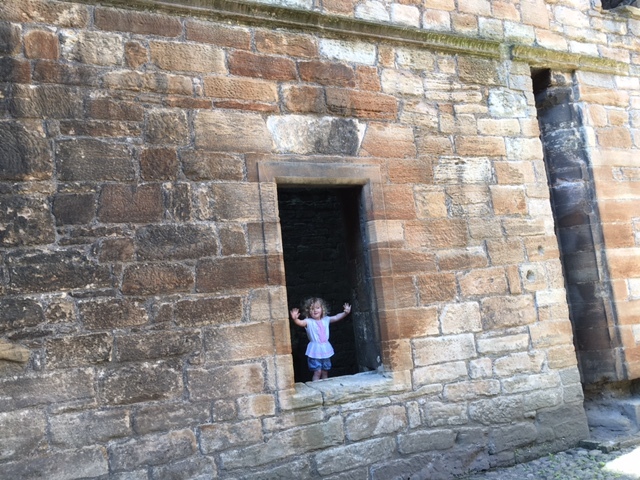 The little lady really enjoyed exploring Linlithgow Palace. There are lots of stairs to climb and you can get pretty high up. I liked the views from up there, but she liked how echoey her loudest voice could be if she pointed it in just the right direction. Her favourite thing were the fireplaces though. Dogs are allowed into the courtyard. I can’t remember if they’re allowed in the castle or not but I’m sure I did see a little terrier roaming the ramparts (on leash) with his owner. We hooked our pup up to a bench in the courtyard and she was quite happy down there. She wouldn’t have been able to navigate the stairs anyway. 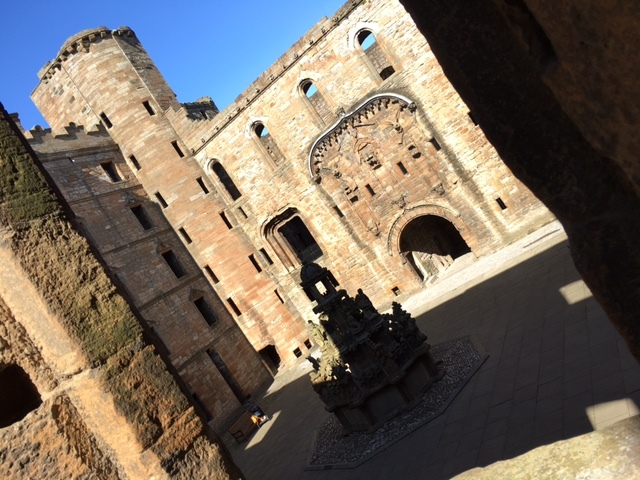 Linlithgow Palace is a Historic Scotland site and so entry to the palace is free if you are a Historic Scotland or NTS member. For everyone else it is £6 for adults and £3.60 for children. Under 5’s go free. Entry to the grounds and the walk around the loch is free. 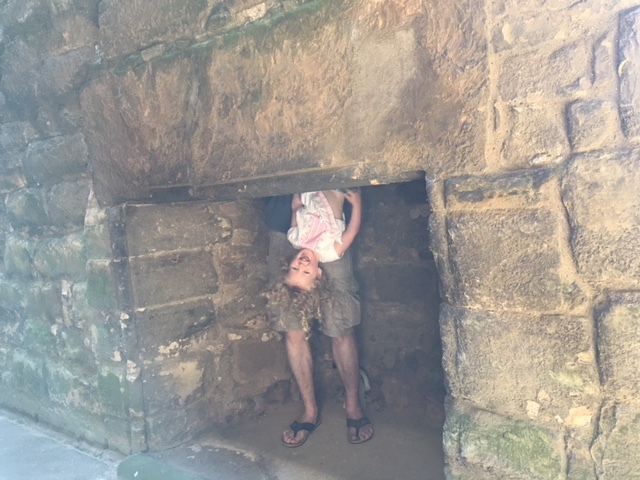 Linlithgow Palace is a really fun castle to explore. It is incredibly pretty with a really interesting history. There are lots of stairs and lots of different rooms and chambers to explore. 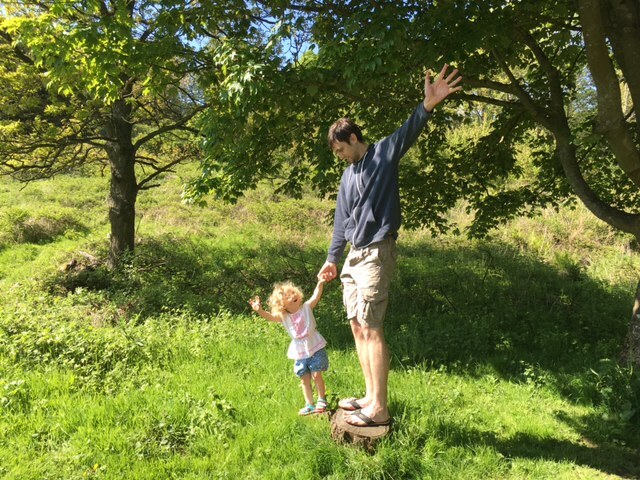 The grounds are beautiful and the walk round the loch isn’t too long or strenuous for little legs. If you take a picnic, it’s a lovely place for a day trip. Linlithgow Palace is located at Kirkgate, Linlithgow, EH49 7AL.